Every time I walk into the backyard, the chickens quickly notice me and immediately start making noises. They’re like little feathered watch dogs. 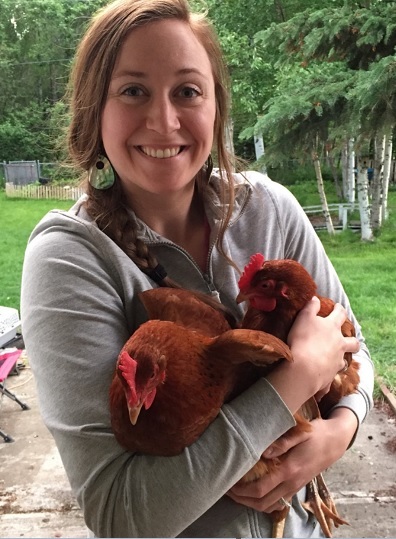 I live within city limits of Anchorage, Alaska, and I have a little backyard flock of five hens (so all female chickens). I didn’t realize that hens made so much chatter. I thought only roosters made noise, but nope, hens are very talkative, too. Here’s a video of the funny chicken noises these little ladies make when I walk outside by their coop and say ‘hello’ to them. So, I skimmed through your article, will pin it and come back later to really absorb what you have to say here! As I was reading about electric fences (your comment about pigs not having a reliable back-up function made me laugh out loud–and I’m alone in the house! ), I thought of something I read in the Countryside magazine a few years ago. This man wrote in and said he would paint some peanut butter on the electric fence, with it cut off, of course, and when the deer came to look longingly into his garden, they’d smell the peanut butter, lick it, and SHAZAM!!! Mind blown!!! ha, ha! He said even the next generation of deer would leave the fence alone and not go over it, even if he didn’t keep it turned on all the time. I wonder if one could do that with pigs to teach them to respect the electric fence? I don’t have pigs yet–just got a milk cow this year, and am learning all about milking and what to do with the milk thereafter–but one of these days, I’m going to get me some pigs to raise for the fun and then the meat!